Sneferu (Soris), nomen in Indice Regum Abydos circumdatum. Calcaria Soris statua, in Museo Aegyptio conservata. Imago Soris albam festi Sed trabeam gerentis, in templo funereo apud Sahshur et nunc in Museo Aegyptio exhibita. Pyramis Meidensis Soris apud Meidum. Pyramis Flexa Soris apud Dahshur. Soris (Graece Σώρις) fuit Aegyptius domus quartae rex (pharao) per Regnum Vetus et domus conditor. Huni successit. Aestimatur spatium eius imperii viginti quattuor anni (2613 ad 2589 a.C.n. ), triginta anni, vel etiam quadraginta octo anni fuisse. Saltem tres exstantes aedificavit pyramides, ac descriptionem constructionemque pyramidum in Aegypto antiqua renovavit. Uxor fuit Hetepheres I, mater Cheopis. Notissima regni Soris monumenta sunt tres pyramides quas in necropole apud Dahshur aedificari iussisse censetur: Pyramis Flexa, Pyramis Meidensis, Pyramis Rubra. Ipso regnante, structurae pyramidum monumentalium progrediebantur, ad Cheopis Magnam Pyramidem demum tendentes, culmen, ut multi credebant et iam credunt, maiestatis splendorisque Regni Veteris Aegypti antiquae, unumque quidem e septem miraculis mundi. ↑ Nomen a Manethone datum. 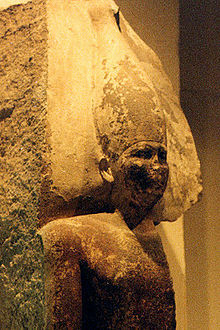 Litteris Aegyptis Sneferu, Snefru, Seneferu, Snofru. Anzovin, Steven, et al. 2000. Famous First Facts. Editio internationalis. H. W. Wilson Company. ISBN 0824209583. Andreu, Guillemette. 1997. Egypt in the Age of the Pyramids. Ithacae: Cornell University Press. Bard, A. Kathryn. 2008. An Introduction to the Archaeology of Ancient Egypt. Malden: Blackwell Publishing. Budge, Wallis. 2008. The Literature of the Ancient Egyptians. The Project Gutenberg. Dodson, Aidan, et Dylan Hilton, eds. 2004. The Complete Royal Families of Ancient Egypt. Londinii: Thames and Hudson. Helck, Wolfgang. 1974. Snofru. Studien zur altägyptischen Kultur 1:215–225. Hamburgi: Buske. ISSN 0340-2215. Krauss, R. 1996. The length of Sneferu's reign and how long it took to build the 'Red Pyramid'. Journal of Egyptian Archaeology 82: 43–50. JSTOR 3822113. Lepre, J. P. 1990. The Egyptian Pyramids: A Comprehensive Illustrated Reference. Londinii: McFarland & Company. Malek, Jaromir. 2000. In The Oxford History of Ancient Egypt, p. 87. Schneider, Thomas. 2002. Lexikon der Pharaonen. Dusseldorpii: Albatros. ISBN 3491960533. Shaw, Ian, ed. 2000. The Oxford History of Ancient Egypt. Oxoniae: Oxford University Press. Stadelmann, Rainer. 1987. Beiträge zur Geschichte des Alten Reiches: Die Länge der Regierung des Snofru. Mitteilungen des Deutschen Archäologischen Institutes Kairo 43: 229–240. Moguntiaci: von Zabern. ISSN 0342-1279. Vicimedia Communia plura habent quae ad Sorem spectant. Vicimedia Communia plura habent quae ad pyramidem meidensem spectant (Meidum Pyramid, Seneferu). Vicimedia Communia plura habent quae ad pyramidem rubram spectant (Red Pyramid, Seneferu). The Instruction of Kagemni. Ancient Egyptian Books of Wisdom. Novissima mutatio die 27 Februarii 2018 hora 04:25 facta.